Despite advances in drug discovery and modifications in the chemotherapeutic regimens, human infections caused by free-living amoebae (FLA) have high mortality rates (~95%). The FLA that cause fatal human cerebral infections include Naegleria fowleri, Balamuthia mandrillaris and Acanthamoeba spp. Novel drug-target discovery remains the only viable option to tackle these central nervous system (CNS) infection in order to lower the mortality rates caused by the FLA. Of these FLA, N. fowleri causes primary amoebic meningoencephalitis (PAM), while the A. castellanii and B. Mandrillaris are known to cause granulomatous amoebic encephalitis (GAE). The infections caused by the FLA have been treated with drugs like Rifampin, Fluconazole, Amphotericin-B and Miltefosine. Miltefosine is an anti-leishmanial agent and an experimental anti-cancer drug. With only rare incidences of success, these drugs have remained unsuccessful to lower the mortality rates of the cerebral infection caused by FLA. Recently, with the help of bioinformatic computational tools and the discovered genomic data of the FLA, discovery of newer drug targets has become possible. These cellular targets are proteins that are either unique to the FLA or shared between the humans and these unicellular eukaryotes. The latter group of proteins has shown to be targets of some FDA approved drugs prescribed in non-infectious diseases. 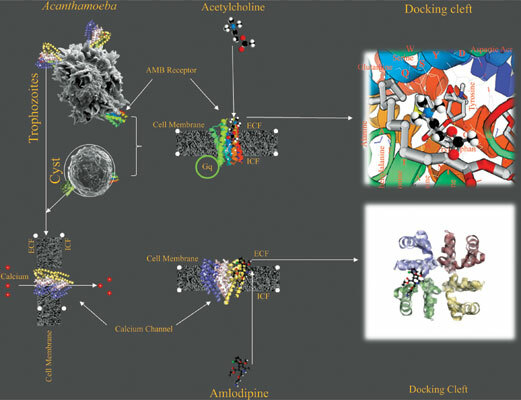 This review out-lines the bioinformatics methodologies that can be used in the discovery of such novel drug-targets, their chronicle by in-vitro assays done in the past and the translational value of such target discoveries in human diseases caused by FLA.
Keywords: Drug target discovery, free-living amoeba, Acanthamoeba, Naegleria fowleri, Balamuthia mandrillaris, structure activity relationship. Keywords:Drug target discovery, free-living amoeba, Acanthamoeba, Naegleria fowleri, Balamuthia mandrillaris, structure activity relationship. Abstract:Despite advances in drug discovery and modifications in the chemotherapeutic regimens, human infections caused by free-living amoebae (FLA) have high mortality rates (~95%). The FLA that cause fatal human cerebral infections include Naegleria fowleri, Balamuthia mandrillaris and Acanthamoeba spp. Novel drug-target discovery remains the only viable option to tackle these central nervous system (CNS) infection in order to lower the mortality rates caused by the FLA. Of these FLA, N. fowleri causes primary amoebic meningoencephalitis (PAM), while the A. castellanii and B. Mandrillaris are known to cause granulomatous amoebic encephalitis (GAE). The infections caused by the FLA have been treated with drugs like Rifampin, Fluconazole, Amphotericin-B and Miltefosine. Miltefosine is an anti-leishmanial agent and an experimental anti-cancer drug. With only rare incidences of success, these drugs have remained unsuccessful to lower the mortality rates of the cerebral infection caused by FLA. Recently, with the help of bioinformatic computational tools and the discovered genomic data of the FLA, discovery of newer drug targets has become possible. These cellular targets are proteins that are either unique to the FLA or shared between the humans and these unicellular eukaryotes. The latter group of proteins has shown to be targets of some FDA approved drugs prescribed in non-infectious diseases. This review out-lines the bioinformatics methodologies that can be used in the discovery of such novel drug-targets, their chronicle by in-vitro assays done in the past and the translational value of such target discoveries in human diseases caused by FLA.